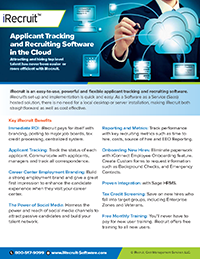 iRecruit’s customers have received an average of 185 new employment applications in the month of June. This trends up slightly from June which showed an average 174. This number actually varies based on the number of jobs posted. This entry was posted in Blog, iRecruit Blog and tagged applicant tracking, applicant tracking ats, ats, employment, hiring, iRecruit, statistics, stats. Bookmark the permalink.